My god, press 'C' for cheat and have fun. A legend group and a classic intro, blink blink. TRIAD - PUSH C BUTTON FOR CHEAT!!! Your telling me! The 64 years were great, many hours spent behind that monitor. I miss the 64 scene. Best time in life. i will never forget TRIAD in my life, a true legend. This newer version with the "gold effekt" is also very nice. A true classic! Mr. Z is a true hero for lots of people including me. I got the intro-maker file for this a created a Triad intro for myself. Geeky but fun! Skydive deserves a lot of credit for designing the logo. mr.Z was a living legend during this period in Yugoslavia. nice intro. i worship the logo more and more as time goes by. Mr.Z one of the very best crackers! Greetings to all from Triad. A yeah.... One of my favourites. I remember that intro on c64, too. Maybee some people knew it from Amiga, maybe? 5: Are there hidden meanings of the classic Triad intro? In case you woundered: Yes, there are. Some people ask us about this. The classic intro with its 40x6 characters in one of 6 different combinations colours and a four-coloured, massive or striped scrolltext below it, do hold a secret. The colour of the 40x6 logotype is a rank of the games' quality in the eyes of the cracker who performed the act of liberating the game from its copy-protection. The rank goes on an ordinal scale from black to gold, where Black is worst and Gold is... Gold. The scale is as follows: Black, Grey, Green, Red, Blue, Gold. Some may say there is no gold colour on the C= 64, well OK then, it is Yellow. Yellow cracks are the best. Pleased? As you can see Red colour is for mediocre games, and that is why you see the Red colour so often. The inventor of the colour-code was probably Ixion. It is the kind of things he would come up with. The original designer of the 40x6 logo was Skydive. Another thing about Triad cracks you should notice, is that in some old games you can press "C" or "T" instead of Space to get into Cheat / Trainer modus. Sometimes this is mentioned in the scroll, sometimes it is not. This feature was first put into some cracks on request from Ixion, who found out that Mr Z played through all games he cracked to make sure they worked properly. Of course he could not do that in reasonable time with the game in normal modus, so he cheated. Ixion then convinced Mr Z to include cheat mode in the cracks through this mechanism, and that is how Triad became the first group ever to support cheat mode in cracks. 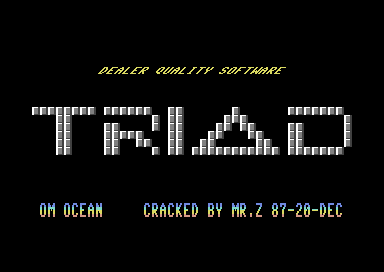 The legendary Triad intro used by Mr. Z circa 1987. This would have to be one of the most used intro's in c64 cracking history. A variation of this intro was used for SIN (the Steady Importing Network) who were members of Triad for a short period of time.